Remember last week when I mentioned I’m all about comfort food? 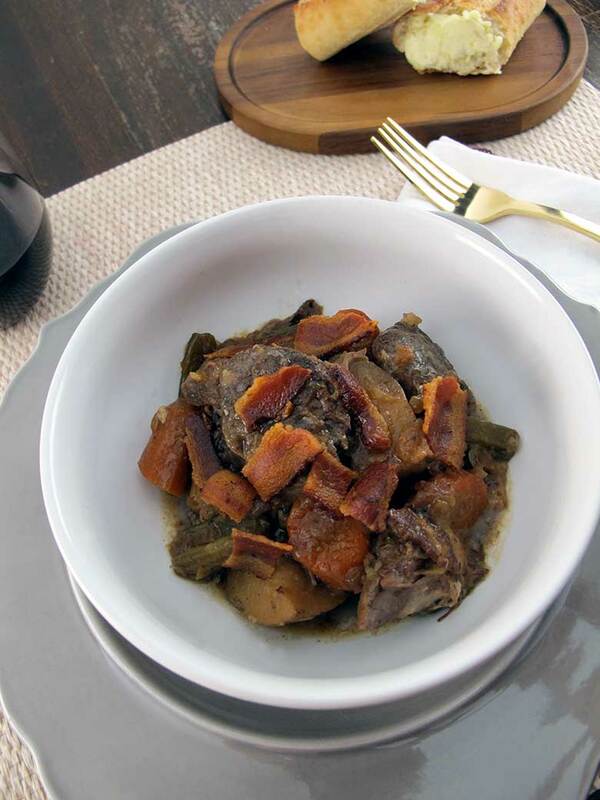 Well, we’re gonna stay right in that zone for another week with some Savory Bacon Pot Roast. It’s a cheap way to entice you, but I’m betting it worked, right? Here’s the deal, I know slow cookers are praised as the amazing-wonderful-ninja-tool that cooks while you’re at work you binge watch Making a Murderer (I confess I haven’t watched it yet), but it can overcook a stone if you leave it going for 8-10 hours, so I save it for days I can keep an eye on it. Since I usually keep close to home on Sunday, that’s when I break out the Crock Pot. [Note: If you’re shopping, go for the versions with a Keep Warm feature, it’s one more bit of protection against mushy, overcooked meals.] I can get things going in the morning (late morning, even! ), clean up, and then putter around until early evening when dinner is magically ready. Plus, since all the clean up is taken care of, you can feel totally justified sitting on the couch in pajama pants and watching one or two or three more episodes. Place cut potatoes, carrots, & celery in the bottom of the slow cooker. Cook bacon until brown and crispy. Discard all but 3 tablespoons of bacon fat from the pan. Season one side of the roast with salt and pepper and sear, seasoned side down, in bacon fat until browned; another 8-10 minutes. While the roast cooks, crumble or roughly chop the bacon. Reserve about 1/3 for serving and scatter the rest on top of the vegetables in the slow cooker. Turn the roast and sear the second side until browned. Place roast on top of the vegetables. Add the diced onion and cook until softened, about five minutes. Stir tomato paste into the onions until coated. Add the Savory Pot Roast Seasoning to the pan and stir in 1-1/3 cup water. One throughly mixed together, pour over the roast in the slow cooker. Serve with reserved bacon crumbled over the top. When I make this, I set it to cook on low for 6 hours and then switch to Keep Warm, which is still bubbling hot, but not enough to overcook the roast. Also, I’m not usually one for single-use materials (especially plastic), but these will save you from having to scrub and/or soak your slow cooker after dinner. Psst! Make sure to signup to my email list for updates!